There are some really tricky versions of Waltzing Matilda around, but in this lesson we are just going to be looking a super simple version so you can see the chords and the scales mixing together. I've left the fancy version for the DVD bonus material if you wanna try something harder, but really at this point you want to keep it simple and get to grips with combining the Chords, Melody and Fingerstyle Patterns 'cos that is a lot to deal with!! Save the harder version until you have finished the whole course (there are some tricky bits in the DVD version!). Once you're through this lesson we're going to make the basic thumb pattern more complex and add in hammers and flicks to our patterns! 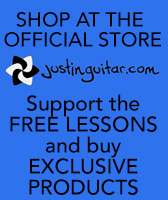 so MAKE SURE you are confident with all the fingerstyle patterns we have looked at up to this point!